How Long Does It Take a Check Deposit at the ATM to Clear? Posting and clearing times for checks deposited at the ATM are different at every bank but understanding how the process works can give you a better idea of when you can get your hands on the cash. An analysis by MyBankTracker indicated a check will take anywhere from two to 11 business days to clear, depending on the size of the check, how long you’ve had your account and what bank the check is issued from. When Does a Check Deposit at the ATM Clear? What If the Check Deposit Bounces? Even though your balance may reflect the full amount of the deposit on the day it’s posted, your check hasn’t actually cleared at this point. The bank is essentially giving you credit for the money but the funds still have to be released from the account of the person or company who wrote it. Assuming there are no problems, this process can take anywhere from 2 to 11 business days, depending on the size of the check, how long you’ve had your account and what bank the check is issued from. While you can make a check deposit at an ATM at any time during the day or night when you put it in makes a difference in terms of when it actually posts to your account. At the top banks, the cutoff time for deposits made at the window is either 2 p.m. or the end of the business day, with the exception of TD Bank, which gives you until 8 p.m. The cutoff times for ATM deposits, however, vary substantially from one bank to another. Chase customers, for instance, have until 11 p.m. ET to get their check to the ATM in order for the transaction to post the next day, but if you bank with SunTrust, you’ll need to make your deposit by noon. Generally, if you wait until after the cutoff time, your check will be included in the next business day’s processing, which means it would take an extra day to post. For example, if you made a deposit at a SunTrust ATM at 2 p.m. on a Tuesday, it would be processed at the end of a day on Wednesday and post to your account on Thursday. Tip: Any ATM deposits made the day before a weekend or holiday won’t post until the second business day. When you deposit checks at the ATM, the money doesn’t show up in your account right away. Typically, if the check is for more than a couple of hundred dollars, the bank will hold a portion of the deposit. TD Bank, for instance, makes the first $100 of a check deposited at the ATM available that day but the remaining amount wouldn’t hit your account until the next day, assuming you got it in before the posting cutoff time. 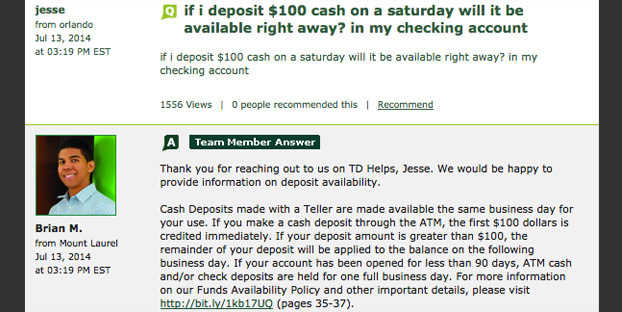 Here’s an explanation from TD Bank’s website of how long it would take to deposit cash. Each bank has its own guidelines for determining what amount of an ATM deposit must be held and for how long. TD Bank’s $100 same-day availability rule only applies to accounts that have been open for 90 days or more. If your account has been open less than 30 days, the entire check can be held for 7 to 10 days to allow the bank to verify it. Besides the age of your account, there are a few other factors that can determine when check funds deposited at the ATM become available. For example, it’s fairly standard for banks to initiate a longer hold when you’re depositing $5,000 or more worth of checks. It’s also not uncommon for banks to do so if you’ve had repeated overdrafts on your account or there’s reason to believe that the check you’re depositing won’t be paid by the other party’s bank. One thing to be aware is what can happen if a check you deposit ends up being returned for insufficient funds. In that situation, the bank would debit the amount of the deposit from your account and also charge you a Returned Item fee, even though you’re not the one who wrote it. At the top U.S. banks, this fee ranges from $10 to $40, depending on the type of item that was returned. On top of the Returned Item fee, you may also be looking at overdraft charges if you spend the money before the bank determines that the check is no good. Overdraft fees range from $34 to $36 at big banks, which can really add up if you have multiple transactions that go through prior to having the check taken back out of your account. Tip: If you’re unsure on whether a check will clear, you can always cash it at the bank at which it was issued. There’s usually a small fee for doing so (if you’re not a customer of that bank) but it’s less than what you’d have to pay if the check was returned. Although it’s not as common, some banks will allow you to make deposits to your account using another bank’s ATM if they have a relationship with that bank. TD Bank customers, for example, can deposit checks through any ATM that’s listed as an NYCE Shared Deposit machine. Many community banks and credit unions also offer this service. 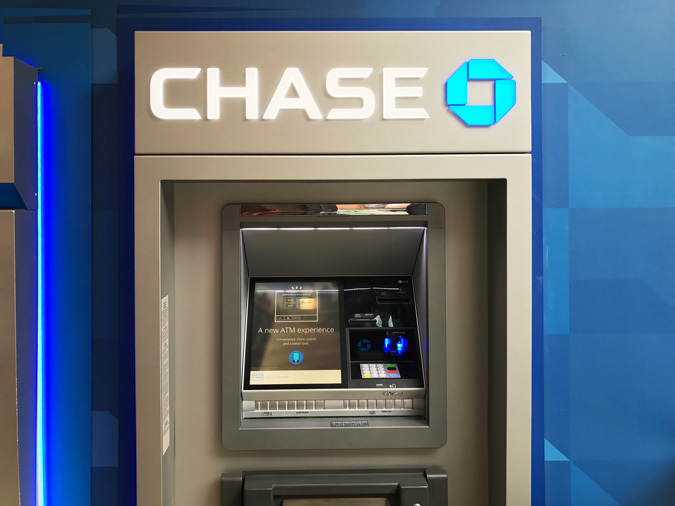 While it may be convenient to use a shared deposit ATM, it can slow down processing of the check even further. At TD Bank, using a shared machine can add as much as 5 to 7 days or more before the check posts to your account.